If you live in South Florida, Orlando or anywhere across the state, and you suffered an injury or lost a loved one as the result of someone else's negligent, careless or unlawful actions, you owe it to yourself to contact Leighton Law for the exceptional advocacy and support you need to help you obtain the justice you deserve. With offices in Miami and Orlando the firm provides statewide coverage for serious injury cases. Board-certified as a civil trial lawyer and possessing more than 33 years of legal experience, our law firm's founder and managing partner, John Elliott Leighton, has achieved unprecedented success throughout his career. He has earned numerous awards and honors for his impeccable professionalism. This includes selection in Best Lawyers in America, Florida SuperLawyers, Florida Trend magazine "Florida Legal Elite", "Top Lawyers" in South Florida Legal Guide and "Orlando Legal Elite" in Orlando Style magazine. Over the course of his career, he has recovered millions of dollars for our clients, including some of the largest settlements and verdicts ever awarded in the country. A recognized leader in his field, particularly in negligent security and medical malpractice cases, Mr. Leighton has written extensively and conducted lectures throughout the country on a variety of legal topics related to personal injury law. He has served as Chairman of the American Trial Lawyers' Motor Vehicle and Highway Section, and was recentlt elected President elect of the National Crime Victim Bar Association. He regularly appears on numerous television and radio broadcasts, offering in-depth legal commentary on various legal issues. He is the author of the leading textbook in the field of negligent security and violent crime litigation, Litigation Premises Security Cases and regularly teaches lawyers trial skills from around the country. Working alongside dedicated and seasoned lawyers and paralegals in the firm, Mr. Leighton and our law firm can help you secure the maximum amount of compensation for the damages you incurred. We promise to remain with you throughout all legal proceedings to ensure we have done all we can to support you during your difficult and uncertain time. 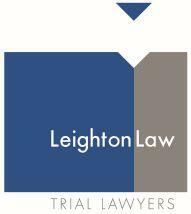 Whether your injury or loss was caused by a motor vehicle or truck crash, an act of medical malpractice, a defective product, or because of assault or sexual abuse, you can turn to Leighton Law for the aggressive and highly skilled representation you need. To discuss your claim at no cost, you can contact our law office to schedule a free initial consultation. Mr. Leighton's book is the leading text on investigating, preparing, litigating and trying negligent security, violent crime, mass shooting and sexual assault cases. This 2 volume book is updated yearly.